So on Friday when you choose what you are going to wear that day, when you decide what items to put on that help you feel like you and give you that boost of self confidence that your style does, pause for a minute and take a picture of the garment. 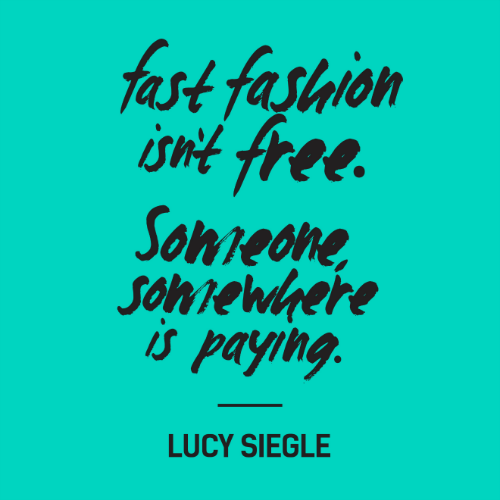 Tweet, Facebook or Instagram the brand and simply ask them #whomademyclothes? so you can thank them! Last year I contacted Joules about who made one of my favourite jackets and I got no response – the garment is a good few years old now but I still think a response should have been given to me. This year I plan to contact them again along with another couple of brands. Are there any particular brands that you want to contact? I am giving the final words of this post over to the wonderful Lucy Siegle, this quote is really spot on. Good to see you are still very much engaged in ethical and sustainable wardrobe issues. I emailed Boden numerous times a few years ago. Finally after tweeting that they were obviously not interested in this subject matter as they hadn’t bothered to answer 6 months of emails I got an answer. A very unsatisfactory one, mind you. Still the more people who question, and question, openly the better! Good news! Boden responded quickly to my tweet saying to email them the code on my top and they will send me all the details. I will let you know how I get on but that is a bit of progress on the 6 months of ignoring your emails. I am really surprised about Boden! I’m curious what’s really up with American Apparel given all the recent news stories. Yeah I am too, I was hoping it would be a nice antidote to the lack of information from Joules . I haven’t heard much about American Apparel over here, I have thought about buying their stuff but never actually given over my cash – I am off to Google the news stories about them now! I got a quick response to my tweet to boden! They said I have to email them my code and they will send me the details.